Guangzhou, China (CNN) -- Dogs bark and whine behind high chain-link fences, some of them gnawing the wire so hard they bleed at the mouths while cats packed into crowded cages cower in fear if anyone approaches. This isn't a pet store -- it's a meat market in Guangzhou, a city in southern China where eating cats and dogs is common practice. At the Han River Dog Meat Restaurant in central Guangzhou, diners can choose from a long list of menu items, including dog soup, dog steak, dog with tofu and more. In the kitchen, the chef chops up meat for dog hot pot, one of the more popular dishes. Most customers like it spicy. "Dog meat is good for your health and metabolism," explains Li, the hostess who declined to give her first name. "In the summer it helps you sweat." Should cat and dog meat be banned? But these local restaurants may have to find a new specialty. The Chinese government is considering legislation that would make eating cats and dogs illegal. Professor Chang Jiwen of the Chinese Academy of the Social Sciences is one of the law's top campaigners. "Cats and dogs are loyal friends to humans," he said. "A ban on eating them would show China has reached a new level of civilization." Eating dog meat is a long-standing culinary tradition not just in China, but also Korea. 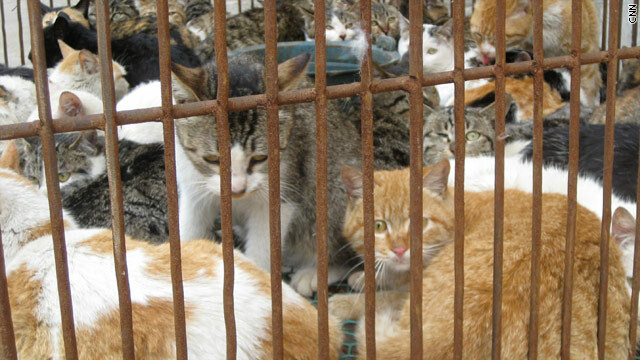 Cat meat can be found on the menu in China, Vietnam and even parts of South America. The Chinese government has signaled a willingness to take the meat off the market. To avoid upsetting international visitors during the Beijing Olympics, officials ordered dog meat off the menus at local markets. Officials in Guangzhou have warned vendors to stop selling it ahead of the Asian Games which will be held there later this year. The legislation is gaining support from China's growing number of pet owners. With living standards rising and disposable income growing, more Guangzhou residents are investing in house pets. "I would never eat dog meat," said Louisa Yong, as she clutches her pet cocker spaniel. "It's so cruel!" Meat vendors have a different view. "The dogs you raise at home, you shouldn't eat," said Pan, a butcher who also declined to give his first name. "The kind raised for eating, we can eat those." Many of the dogs and cats sold for meat are specially raised on farms. But Chang said there is always a chance they're someone's lost or stolen pet. In anticipation of the new ban, dog and cat meat has become more difficult to find, though some vendors say they will keep selling it as long as they can. "The legislation will definitely affect our restaurant," said Li. "We'll just wait to see the result." And it seems restaurants don't necessarily need to change their menus anytime soon. According to the Chinese Academy of Social Sciences, the law prohibiting cat and dog meat could take as long as a decade to pass. Until then it's a la carte, from the cage into the kitchen.